Look no further! This might just be THE answer to all your parenting pleas, cries and problems. If you ask me, this is India’s parenting bible. Period. Little did I realize how bloody good this book would turn out to be when I first laid my hands on it! The author, Dr Tanu Shree Singh has a knack of enticing her readers right away with her intelligent wit, creative bent of mind, endearing humility and a wildly free-spirited attitude. As soon as Ms. Singh got me all hooked with her fascinating introduction titled ‘Confessions of a Not-so-super Mom’, I flipped to the back page of the book earnestly looking forward to reading the author bio and seeing the face behind this highly evolved brain. Boy! Was I pleased to see a gloriously beaming face with salt and pepper hair and a ‘devil may care’ attitude, which I personally think is the best kind of attitude to sport in this thickly populated ‘Log Kya Kehenge’ society! 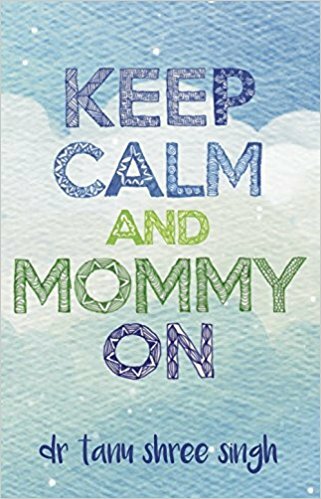 In a nutshell, Keep Calm and Mommy On makes a valiant effort to crack this tough nut job called Parenting. The book is a clever, cheeky pun on this whole halo surrounding parenthood, more so, motherhood in particular. This book comes straight from a brave, young mother who’s been there, done that and got her hands dirty, burnt and bitten but not shy. And coming out unscathed! Hallelujah! She has a lot of clever parenting tips and tricks under her sleeve along with tons of parenting advice and wisdom to get around even the most trickiest child. Previous Dads and Daughters make one rocking pair!